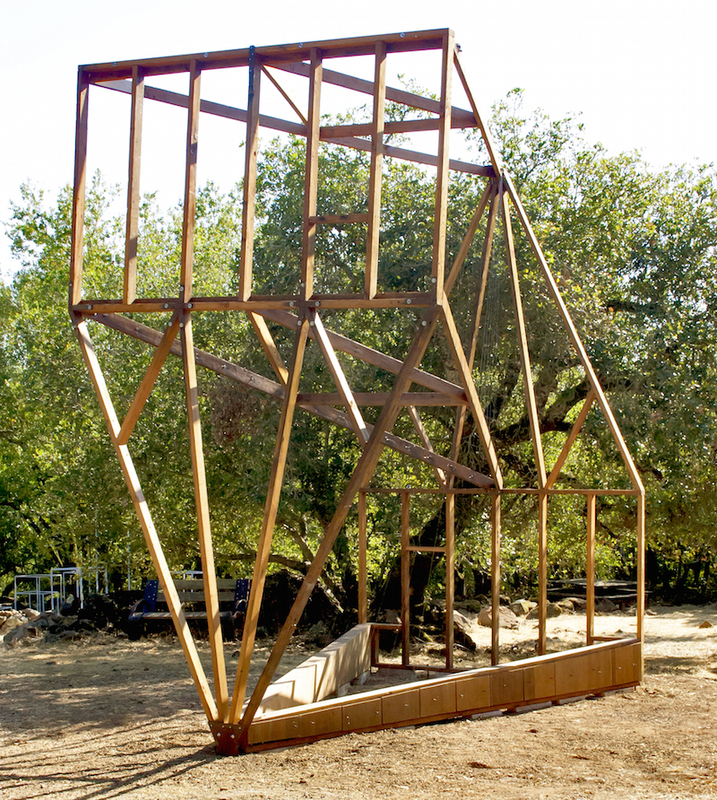 This Side Up, Handle With Care, transforms the skeleton of the artist’s home into a precisely half-size wooden frame model that is half right-side up, and the other half upside down. Virtually twisting the home in the middle to create a vortex. The walls are constructed of piano strings installed at twelve-inch intervals, creating an opportunity for the home to be played with violin bows, plucked or as an Aeolian harp. 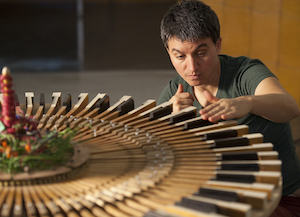 While the piano strings offer audible and interactive elements, they also provide structural support to the piece by drawing on suspension bridge technologies. The entire structure resonates, so if you gently rest your ear on any part of the wood surface, you will hear the piece differently. The piece makes literal and metaphorical reference to the nature of cohabiting: the pleasure, tension and magic that resonate inside the walls of domesticity, and a home’s capacity to tell a story and record history. Question: How do you define home? Terry Berlier is an interdisciplinary artist who works primarily with sculpture and expanded media. Her kinetic, interactive and/or sound based practice focus on the environment, queer practice and ideas of nonplace/place. She has exhibited extensively in solo and group shows both nationally and internationally including the San Jose Institute of Contemporary Art, Contemporary Jewish Museum of San Francisco, Catherine Clark Gallery, Babel Gallery in Norway, Richard L. Nelson Gallery at UCD, Center for Contemporary Art in Sacramento, Kala Art Institute Gallery in Berkeley, San Francisco Arts Commission Gallery, Weston Art Gallery in Cincinnati, Ohio, Pro Arts Oakland, Natural Balance in Girona Spain and FemArt Mostra D’Art De Dones in Barcelona Spain. She received a MFA from University of California, Davis and a BFA from Miami University in Oxford, Ohio. She currently is an Associate Professor in the Department of Art and Art History at Stanford University.